The Padfone form factor is a unique one, and even if it hasn't set the world on fire, I'm glad to see that ASUS continues to upgrade and modify it. The latest iteration appears to be a midrange phone/tablet combo: reliable tipster Evleaks showed a new PadFone Mini model on his Twitter account, with a 4.3" phone body and what appears to be a 7-inch tablet shell. There's no detailed technical information available, though Evleaks does mention a 2013 release. 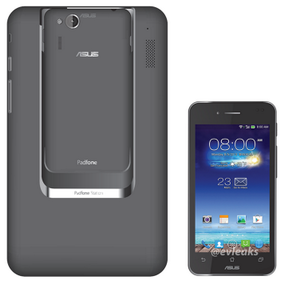 According to this Engadget post, ASUS is planning on launching the Padfone Mini at a Taiwan event next Wednesday. They also got a short spec list indicating Android 4.3, a qHD screen (on the phone at least), 3G radios, and a Snapdragon 400 under the hood. Note the portrait orientation of the tablet dock/shell in this smaller version of the Padfone - a landscape orientation like the previous 10" models probably wouldn't have room for all the necessary components. Presumably the smaller size of the exterior shell and mid-range specs in the phone itself would mean a lower price. So far the Padfone has seen little to no official exposure in the US from ASUS or any retail/carrier partners, and we haven't seen any indication that this will change with a new model. Still, we live in hope that ASUS will strike a deal with a carrier. Until then you can drool from afar or take out a mortgage to get the device from an importer.